This was a short hop I took on October 17th strictly for the fun of it. Sao Tome and Principe are two small islands in the elbow of Africa that comprise a small, Portuguese speaking, independent nation. There was no avgas available there, but the islands were right on the way to my next major stop, Abidjan, and after having been sold on their beauty by the travel literature I saw around Africa, I decided to load up a little extra fuel in Libreville and drop in. I spent one night in a very comfortable hotel right on the waterfront, and took a short driving tour of the Sao Tome main island. It was lovely! The beaches reminded me of the Seychelles, although the poverty I witnessed in the villages was more reminiscent of India. Still, I'm glad I went. 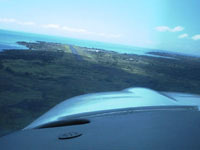 On final approach to Sao Tome's picturesque airport. 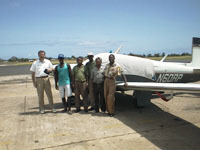 Technicians and ground crew from Sao Tome's tiny little airline that rushed out to greet the Mooney on my arrival. Most had never seen a small piston engine powered airplane before, and the supervisor (standing closest to me) used the opportunity to give his charges a walk-around tour of the airplane and its unfamiliar systems. 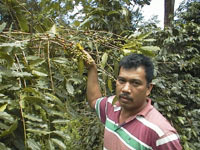 Tour guide Rod (pronounced like "RODE") showing off some of Sao Tome's coffee crop still on the bean laden branches up in the island's high elevation rain forest area. 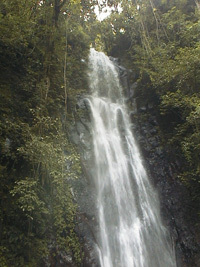 Three views of a dramatic waterfall high in the mountainous Sao Tome rain forest. Rod didn't know its height, but I guesstimated it to be about 150 - 200 ft tall. 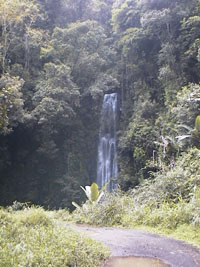 To get here, Rod drove us for almost a half hour up a muddy, single lane pathway cut through the thick vegetation in his 4WD truck. 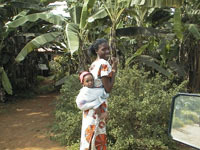 A Sao Tome mom with her baby. Like many others in West Africa, these people long ago learned how to reduce the incidence of back problems that are so prevalent in the West. Babies are carried in this "papoose" manner, and almost everything else is carried on the head. I saw women carrying huge loads of firewood, bound together into bundles and balanced on their heads as they walked almost effortlessly through their villages. Rarely was a stabilizing hand required by these well practiced head toters. Upon reflection, this method of transport makes very good practical sense. As once pointed out to me by a renowned Minneapolis based neurosurgeon, the human spinal column is capable of supporting very large weights vertically, but when these items are instead carried in the arms forward of the body, the back muscles must then pull down on the spine at many times the weight of the load being carried to maintain an erect posture and balance, thus resulting in a large multiplication of the spinal stresses. The Third World has a lot to teach us "civilized Westerners," if only we were willing to learn! 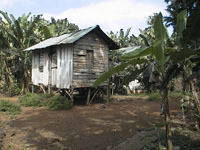 A typical village hut on the side of a Sao Tome main road. The tiny population of this island nation is, for the most part, very poor, and what you see here is about all the home that most people can afford. 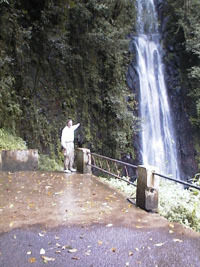 Note the stilts. Like much of mainland Africa, Sao Tome is plagued with large numbers of not so friendly venomous snakes, and this levitation of their homes is the solution contrived by the locals to avert any possible unpleasant nighttime surprises.